On Wednesday August 3rd the Sefateng Stadium in Atok was filled with revolutionary worker songs. 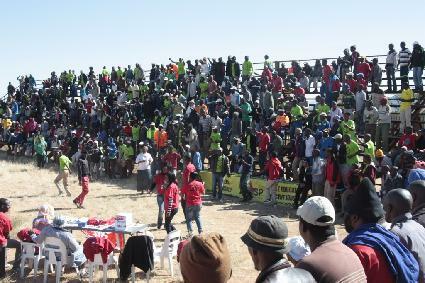 More than 700 people had come to the stadium to launch the Workers and Socialist Party in Limpopo. Mineworkers from Bukoni and Steelport, community activists from different towns and youth sang: “Limpopo when we are united, we can do miracles”. The mineworkers of the Xstrata Steelport mine were the first to arrive in Atok. They have been on strike against racism for months. The company suspended each one of them. Since then they have been fighting for reinstatement. Experienced in mobilizing for their struggle, they toyi-toyied through the town around the stadium carrying WASP banners and posters with their demands. Delegations from Carletonville mine and other places were also present. The long line of speakers was seated in the middle of the stadium with a sound system to address the crowd. Weizmann Hamilton, DSM general secretary and member of the WASP interim committee, was the first to speak: “WASP was established to unify the struggles of the working class”. Speakers saluted mineworkers from both unions present, GIWUSA and AMCU, calling for cross-union solidarity. 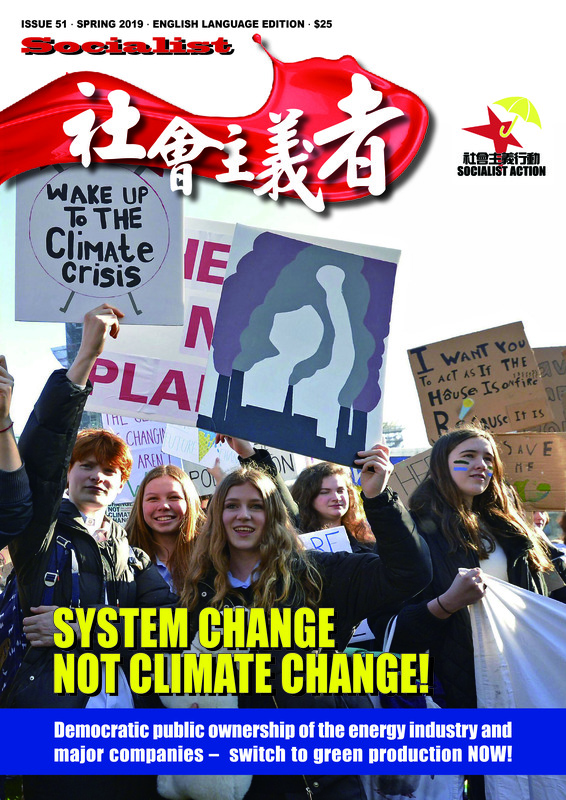 It was emphasized that workers unity has to be established within and across the boundaries of each of the main battle grounds — service delivery protests, student struggles against financial exclusion and unaffordable tuition fees, and workplace action for better wages and working conditions and against retrenchments. His ferocious attacks on the ANC government’s pro-capitalist policies and his outline of WASP’s socialist principles and programme were frequently interrupted with applause from the workers. Weizmann explained how the mine bosses view this year’s wage negotiations as the most important since 1994 and are preparing an onslaught on the working class. They want to restore the balance of forces after the upheavals in the mining industry following the Marikana massacre. They are preparing for mass retrenchments in the mines and there is already a low intensity civil war going on in the mines. “WASP is the answer to these attacks” Weizmann told the audience. The Xstrata company is the first to set an example by retrenching the 2000 workers who went on strike. 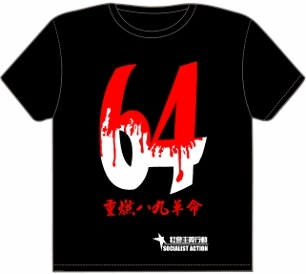 They want to crush workers resistance. This is why WASP puts their case at the top of its agenda and the agenda of the left and trade union movement in general. 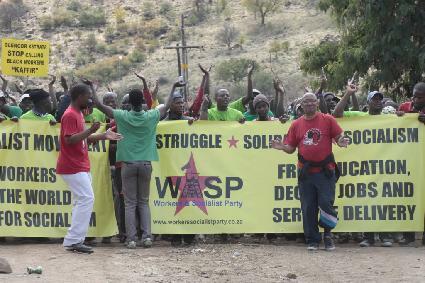 WASP calls for a day of action and a Limpopo wide general strike for their reinstatement and the creation of 100.000 jobs in the Sekhukuni platinum belt. A statement to this effect was handed out to all participants at the launch. This was endorsed by the AMCU shopsteward committee chairperson of Xstrata comrade Mohlala who spoke on behalf of the Xstrata workers. He warned of the planned retrenchments of 250 000 workers in the next five years to come. The working class has to unite against this attack. The launch was also the first time he met comrade Weizmann after over 20 years when they were fighting together in the Marxist Workers Tendency of the ANC (predecessors of the DSM). He reaffirmed his continued commitment to the struggle for socialism emphasising that they both stand in the firm traditions of Marxism. Justice Malatji from the Bokoni Labor Forum spoke for the mineworkers of the region. He explained why they had no choice but to join new trade unions after they were sold out by the corrupt NUM leadership. The mining industry was not the only sector represented at the meeting. Liver Mngomezulu, deputy president of the National Transport Movement, a new militant union that split from the Cosatu affiliate, the SA Transport and Allied Workers Union spoke on behalf of his union. He explained the need of all workers to unite under a mass workers party. He was warmly welcomed by the audience. Trevor Shaku from the Socialist Youth Movement brought greetings of the youth and explained how the creation of more jobs in the mines would help to solve the creeping problem of youth unemployment in the region. The launch was closed by DSM spokesperson Liv Shange. She pointed out how much the capitalists are afraid of the power of the working class at the moment. They are afraid of the battles ahead but also of the outcome of the elections. But the establishment of WASP is not only for the elections but to unite the working class for the struggles to come and fight for a socialist society. After she spoke the voices of singing workers echoed “The capitalists are shaking…” in the Sefakeng stadium. The launch was undoubtedly a great success particularly since it represented a breakthrough into new ground. Until the Limpopo launch WASP’s presence in this province was limited to the Bokoni mine where it has been established by the workers committee. The strong presence of Xstrata workers, who dominated those in attendance, was convincing evidence of the growth and further development of WASP. Already, since the launch, WASP has been contacted by workers from all mines and other industries from all over the region who want WASP to help them form new, fighting militant unions.